Lume, lume, and more lume. It would be easy to love the Tangramatic Hyperion for how well it pulls off ridiculous lume, but there is more here than bright lights. Nearly every part of this piece shows attention to detail and excellent execution. Available in time-only auto or quartz and time/date auto, pre-order pricing is sweet at $250AUD ($185USD) for the Ronda quartz and $360AUD ($265USD) for the Miyota automatic. These prices will of course increase when it hits retail, but there is a lot of value to spare. I wore prototypes of the two automatics for a bit more than a week each; Tangramatic might have to send Hyperion himself to get them back. Named for the Greek Titan of Light, the Hyperion manages an incandescent amount of lume by using a sandwich dial: subtle sunburst on top of SuperLuminova C3. The lume peeks through a cutout hour and minute register on all models, but the time-only auto adds Arabic numerals at 12, 3, 6, and 9. The time-only quartz keeps the 12 and 6, but swaps the odds for evens. Both time-only models have lumed minute numbers printed every five minutes. The date wheel on the time/date model is not lumed, but you’d be forgiven for thinking it was because the lume shines around the edges of the ever-so-slightly-too-small date window. The lume is impressive for a few reasons. It charges rapidly in natural or artificial light, so much so that it always seemed to be adequately charged. Charged deliberately or incidentally, its brightness is unnatural—like something out of Chernobyl—but this sucker isn’t nuclear. I routinely caught flashes of lume as I drove under trees or overpasses because the face lights up in the slightest shadow. And that brightness lasts for hours, easily staying lit overnight. All three hands are also lumed, with long swaths of SuperLuminova set into the main hands and a healthy triangle of light near the end of the second hand. The hour and minute hands are faceted sword batons, lovely on their own but easily forgettable next to the amazing second hand. The skeletonized body of the second hand throws shadows enough to keep my interest, but a pinpoint arrowhead on the business end and a fat baton on the other compete for your attention. The handset is beautifully polished stainless and to my eye the shape of the parts working together is the best kind of savage visual poetry—refined, but still unapologetically blunt. The hands are your only glimpse of the movement at work because the caseback is solid. It is deeply engraved with the Titan of Light himself, Hyperion, and a few sparse details—including the 20ATM water resistance. The ample water resistance is helped along by the screw-down crown, engraved with the Tangramatic star logo. Two hundred meters is probably more than you’ll need on the stock leather strap, but it is nice to have it. Fit, form, and function are all great on the screw-down crown. The case itself is entirely polished, with a simple fixed bezel. It wears small for its 40.5 mm, in large part because of the compact lugs. Deliberately short to accommodate smaller wrists, they look rather stubby. The watch fit my 7” wrist just right, so mission accomplished. They took some getting used to visually, but I ended up finding them to be a charming change to the ordinary lug-to-case ratio. The genuine leather strap is nicely padded and stamped with “Tangramatic” on the inside. The pin buckle is likewise signed, but I preferred the subtlety of the star logo engraved on the buckle of the alternative stainless mesh band. The mesh band functions like a leather strap, with a pin, buckle, metal keepers, and straight ends. The short lugs helped the straight end links look grounded and the metal strap is attractive. While comfortable, the keepers didn’t keep and so it did not see much wrist time in my test. Between the two automatics I had for testing the time-only version got the most wrist time. The numerals added some visual interest to the dial and matched the rugged aesthetic of the explorer style Tangramatic was going for. I also found the dark grey dial more to my liking than the blue on the time/date model. But the time/date version should appeal to plenty, especially the way the date is cradled in the lume like the hands of Hyperion delivering a gift to his acolytes. Who we think it might be for: Nighttime is your time for telling the time. Would I buy one for myself based on what I’ve seen? : I plan to buy the time-only auto. If I could make a design suggestion, it would be: Metal keepers need work on the mesh band; date window is a bit crowded. 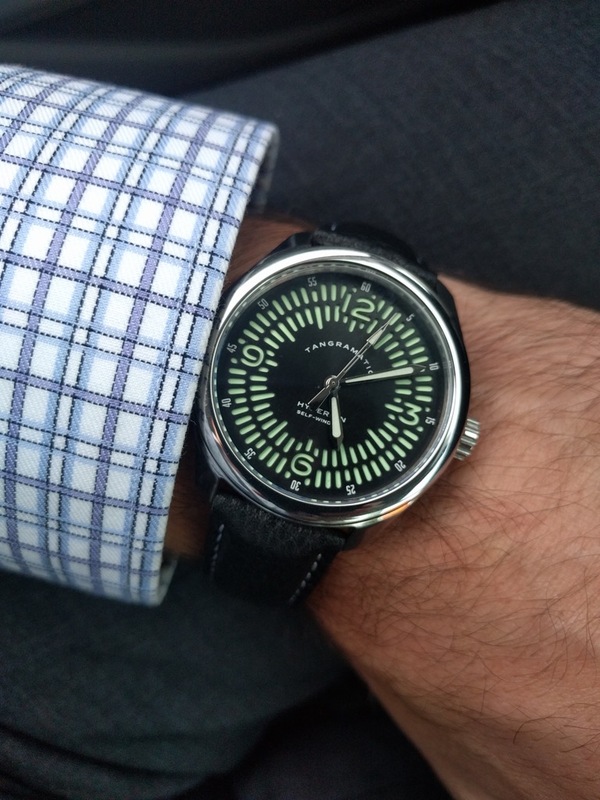 What spoke to me the most about this watch: Lume, lume, and more lume.